Would you cuddle up with a quilt stained with MRSA? 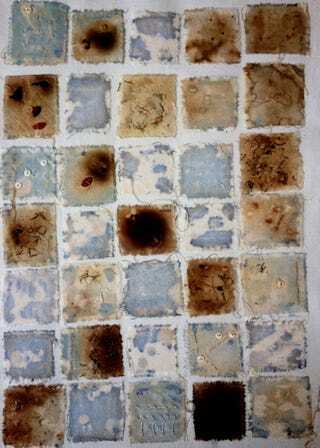 Artist Anna Dumitriu challenges the relationship between humans and bacteria by staining textiles with superbugs. As part of her artist's residency on the UK Clinical Research Consortium Project “Modernising Medical Microbiology” at the University of Oxford, Dumitriu has been developing her MRSA Quilt and Infective Textiles projects. She works with microbiologists to create works that communicate the impact of new technologies in the field. Like many quilts, her MRSA Quilt is meant as a storytelling endeavor. The quilt squares are made using natural and clinical antibiotics on Chromogenic (pigment-generating) agar in which the fabric has been embedded and inoculating the squares with bacteria, creating patterns that reflect the interaction between bacteria and antibiotics. The quilts are embroidered with thread dyed with saffron as well as with the antibiotic Vancomycin. She and her collaborates also created dresses and other textile crafts using microbes cultivated from various sources, including soil, buildings, and public spaces. You can see more of her textile designs over at Ecouterre and at Dumitriu's website.